IS Aix-en-Provence is certified since 2007 with the official government accreditation Label FLE obtaining 3 stars (out of 3) on each of the 5 audited categories: Welcome, Premises, Teachers, Courses and Overall Management. Our school was reawarded with the same number of stars in 2015. IS Aix-en-Provence is also a member of Groupement FLE, EAQUALS and IALC. 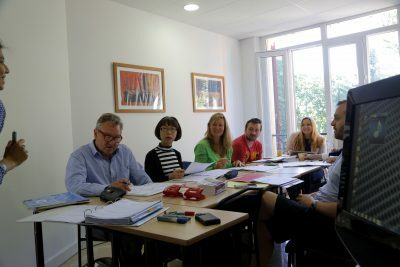 Our international language school specializes in high quality French courses for adults. We offer a wide range of courses to learn French for private or professional reasons. Our various teaching methods focus essentially on oral communication based on real situations, promoting autonomy in communication. The school has already welcomed more than 50,000 students of all ages and from all over the world, since its creation in 1972. Around 40 nationalities are represented every year. All classes are in small groups (up to 10 people maximum) to allow time for each one and give priority and focus on oral communication. You can choose between different formulas according to your needs. Come to Aix-en-Provence, the capital of Provence, to discover the Mediterranean’s charms and to enjoy the renowned quality way of life in the south of France. Come visit our numerous worldwide known natural and historical sites.